After unleashing the evil that is homemade Nutella on to the world, I feel compelled to repent and share something healthy(ish) but equally delicious. Rainbow salad, in case you’re unfamiliar, is a mixture of shredded red cabbage, carrots, broccoli and cauliflower stalks. Beautiful and healthy! You can certainly make your own, but hopefully you can save some time and find it alongside the bagged coleslaw in the salad section of your grocery store. This recipe serves two to three people. Ed and I enjoyed generously sized portions, and there was a wee little bit left over. At $17.99 a pound for good sea scallops, I wasn’t prepared to serve this to my sometimes-picky family of five, but it is good enough that I will double this recipe and serve it to adult dinner guests in the future. Pat scallops dry and season with salt and pepper on both sides, then lightly coat each side with all-purpose flour. Set aside. Heat 2 tablespoons of butter in a 12 inch skillet over medium high heat. 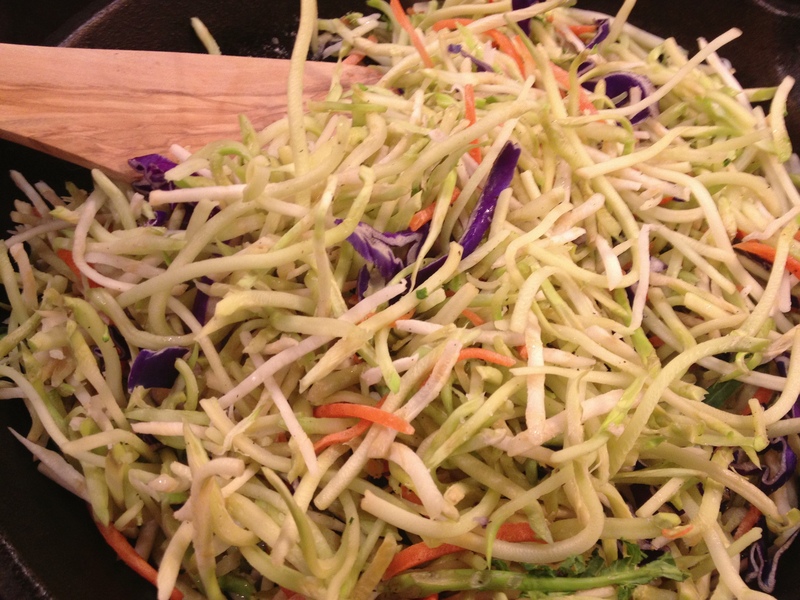 Add the rainbow slaw, a couple generous pinches of kosher salt, fresh ground pepper, and toss to coat well. Stir occasionally, about 2 minutes, and then cover with lid for one minute. Transfer to a warmed platter. In same skillet, heat 1 tablespoon of olive oil over medium-high heat until very hot. Add the scallops, turning them at 3 minutes, and then cook another 2 minutes. Place them atop the rainbow salad on the platter. Turn skillet to medium-low heat, and add remaining 2 tablespoons of butter, juice of half a lemon, 2 tablespoons of water, and 1 generous tablespoon of Dijon mustard, stirring a scraping up any brown bits, until sauce is well mixed and thickened, about 1 to 2 minutes. Season with salt and pepper to taste, and pour over scallops and serve. 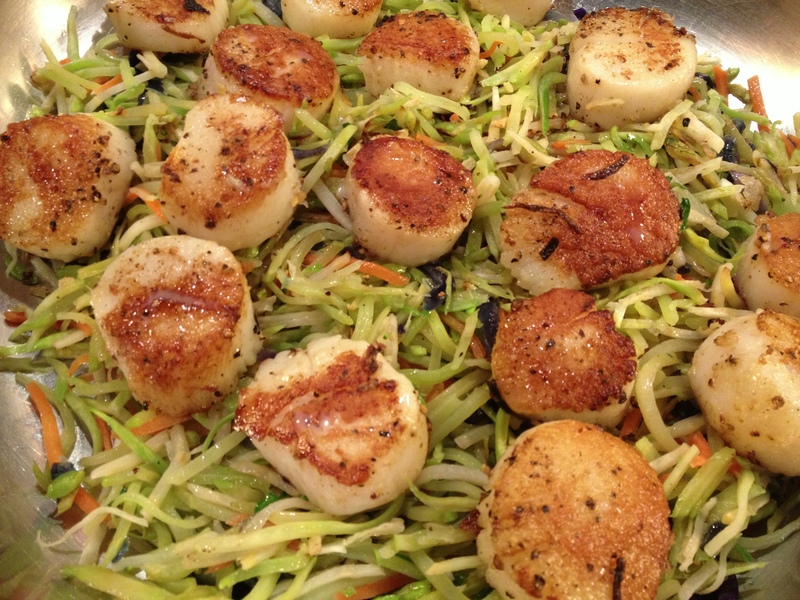 This entry was posted in Main Dish and tagged low carb meals, rainbow salad recipes, sea scallops with mustard sauce by Mom Mom's Apron. Bookmark the permalink. This looks delicious. Your nutella recipe was evil – but it is saved for POST wedding indulgences! Yes, this is definitely more future-bride-friendly than the Nutella! I won’t be safe until that’s all gone…which at this rate, might be today.